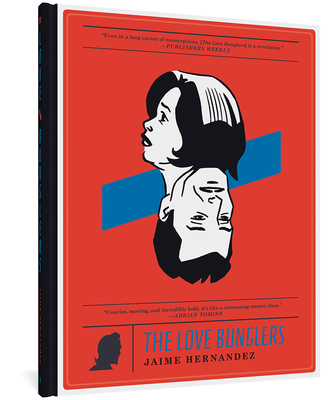 Featuring Hernandez's longtime Love and Rockets heroine Maggie, the suppression of family history is the initial thread that ties the The Love Bunglers together. Because these secrets can't be dealt with openly, their lingering effect is even more powerful. But Maggie's ability to navigate and find meaning in her life -- despite losing her culture, her brother, her profession, and her friends -- is what's made her a compelling character. After a lifetime of losses, Maggie finds, in the second half, her longtime off and on lover, Ray Dominguez. In taking us through lives, deaths, and near-fatalities, The Love Bunglers encapsulates Maggie's emotional history as it moves from resignation to memories of loss, to sudden violence (a theme in this story) and eventually to love and contentment. Much like what John Updike created in his four Rabbit novels, Jaime Hernandez has been following his longtime character, Maggie, around for several decades, all of which has seemed to be building towards this book in particular.